i have the 1999 3.0 with the manual m5odr1 trans. every 1500 to 2000 i change the oil with valvoline 05-30 synthetic blend (fancy conventional) and a fram tough guard filter. every 20k i use generic dexmerc in the trans. and every 30k i do the diffs and t-case. has anyone found a good combo as the 3.0 get high in milage? or am i off to a good thing here? yeah fram is crap overall. I only run Motorcraft air and oil filters. Until I came to the forums I've never heard anything against Fram. In the 9 years I've owned the truck that's all I've used with no issues. i've heard they restrict flow, or fail easy. either way i figure you cant go wrong with motorcraft since its made for ford. I recently bought my 2003 Mazda B2300 with 38.5k miles on it. The previous owner had the oil changed every 3,000 miles like clockwork. His repair shop used a generic filter and Kendall 5w-30w oil. When I had the intake and valve cover gaskets replaced, the repair shop (All Pro Automotive, Kennesaw, GA) stated that the engine looked "pristine". So how often you change the oil has a major impact vs the oil or filter used. Going forward, under my ownership, I will change the oil every 5,000 miles using Mobil 1 0W-40 Euro formula and Bosch Distance Plus Filters. My choice of these two products is after many, many, hours of reviewing detailed lab reports/reviews on them. Last edited by GMG; 09-10-2013 at 03:42 PM. I also do it every 5k using synthetic oil. Before every 3k but using regular oil. I would love to know where people get the idea of 3ooo miles or three months? I had a 94 ranger and the owners manual clearly stated 5ooo miles or six months. Please enlighten me that your smarter than the engineer that designed your vehicles? Modern SN rated dino oils easily do 5ooo miles and synthetic oils can easily do 7500 to 15000 miles. Research your stuff. I would flow the owners manual and use an oil that meets the criteria required by the maker. Otherwise don't over think it.you can actually do harm changing the oil to often as well. As far as fram goes.... Why buy it when the motocraft specd for your truck is cheaper and better? The upper line of team is ok, but why pay twice the price when you can get oem for four bucks? Last edited by JPZ; 09-19-2013 at 07:02 AM. I used to change my oil every 3000 or 3 months with valvalene 10w 30 then I switched to motorcraft 10w 30 and started changing my oil twice a year. Except this last time I changed it was about two years ago lol. It's still full and not to black but needs to be changed as soon as I get some money. My 3.0L 2003 calls for 5-20W, if I run 5-30 the lifters start to talk to me. Anyway, I use Mobile 1, change oil every 6K and change the filter at 3K with added oil; seems to work. If your yearly miles are on the low side, under 8000 miles,and you drive short distances you should consider changing the oil more often. Changing the oil too much is not a problem, just change the filter with it. AND as all others have stated stay away from FRAM, I have heard they clog up, not all the time but sometimes and when they do there goes the engine; use the Motorcraft or WIX Filter. Most other filters are made from the same method and CAN cause a problem. WIXs filters have been rated top quality and of course cost a little more. I use Motorcraft, only because I can’t find a good supplier for WIX Filters. so how is changing your oil too often causing harm? Changing the oil before the oil or its add package is able to do its job is not good. Science behind it is true. Don't believe me I'm good with that, but to disregard the engineers who made your vehicle or scientists who make your oil is a tough uphill battle. If you change your oil, say every 2ooo miles, its not letting the oil or its additives have enough time to properly work. The idea of "2000 miles or two months" came from the fact it is easier to remember two months and easier to schedule. The old distance between oil changes was every 2000 miles and a filter every other oil change, which alway blew my mind, why run new oil through an old filter. Things change, especially synth-oil, my wife's new car goes 10,000 miles between oil changes. I do not believe changing your oil too often is a problem. The additives work within the first 500 miles and usually the additives are things that make the oil more slippery or sticky not any effect on the metal itself except better lubrication. A 3.0 calls for 5W20 not 5W30. Having owned two of them, I know for a fact. 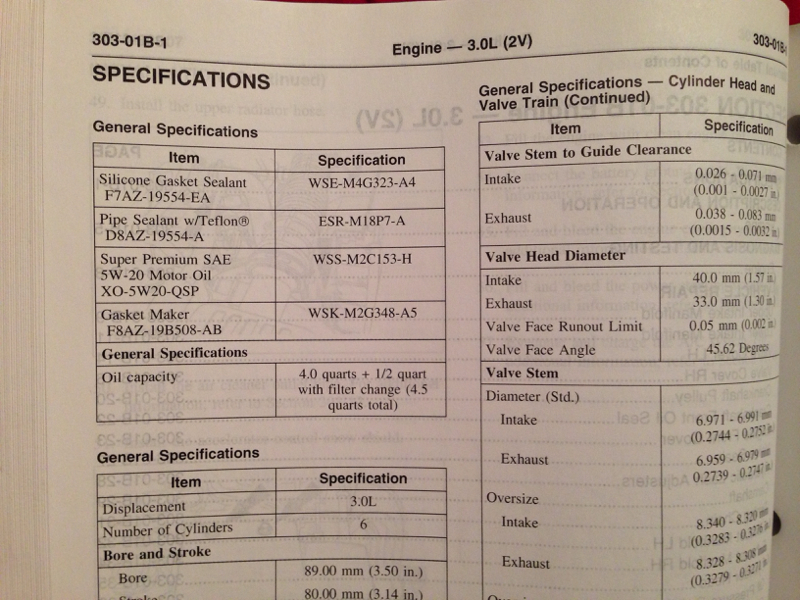 Also, the FORD WORKSHOP MANUAL doesn't lie. 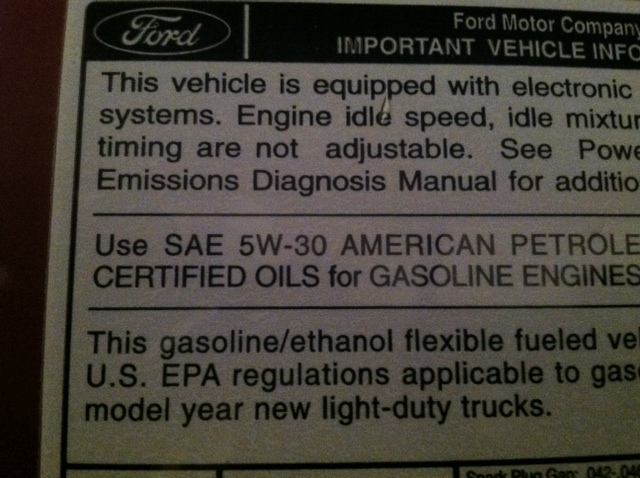 so what your saying is the label, from the factory, under the hood of my truck, does? Quick Reply: usual oil change schedule. opinions?